Sometimes you visit a city and need to tell the world about its crumbling city walls, stunning churches and mosaic mosques. Other times you need to eulogise about its food. Specifically a hamburger. The Islak hamburger may only cost £1 and look like a heart-stopping combination of soggy bap and dirty meat, sold on unreliable street corners across Istanbul – but allow me to dispel such myths. After purchasing said burger from a kind looking man at a stand on Taksim Square (where it had been sitting in a hot glass tank for longer than is probably worth thinking about), I was delighted to discover how soft the bread was. Biting into the warm, soft bap, a rich meat infused tomato sauce oozed out. A few bites later, I was into the heart of the burger… a herby, spiced lamb mince pattie that made me make inappropriate noises and earn unfavourable looks from passer-by’s. The Islak Burger is, my friends, the burger of kings, the king of burgers – the burger that looks down at Burger King from his hot, glass tank and mocks their dry baps and spiceless meat. The pictures of me actually eating it are not suitable for public viewing but here’s me being all excitable by the stand. 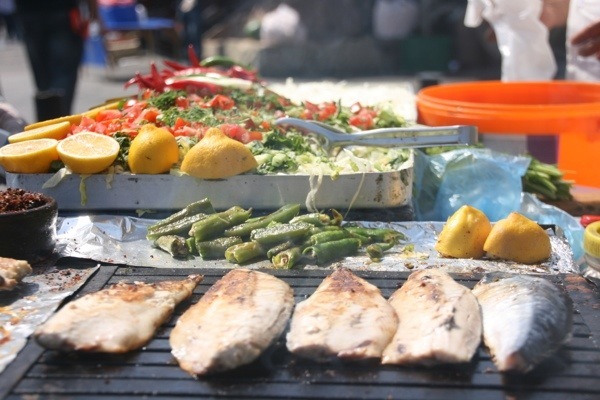 However, if you are after something a little more fresh tasting then I can also heartily recommend making your way to the Gelata Bridge (that crosses over the Golden Horn) to one of the stalls where the fish is grilled fresh from the fishermen’s net. Meaty mackerel (or whatever the catch of the day is) is thrown into a crunchy baguette, drizzled in fresh lemon juice and topped with giant rocket leaves and crunchy onion slices, with a slight sprinkle of salt and paprika. This will set you back just £2 – which means you can definitely go back for seconds. 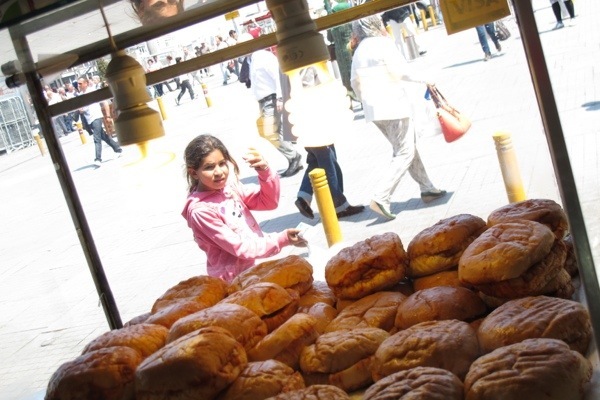 Istanbul is a street food lover’s haven… We drank the juice of three freshly squeezed oranges (costing 50p) every day and munched on giant sesame seed sprinkled pretzels, costing about the same. But it is the rows of dirty looking burgers that is the real secret gem in the city’s street food scene. Trust me*. PS If you want to know more about the highlights of the city then take a look at my picture-led post from when Matty and I first visited Istanbul a couple of years ago. *The hamburger was tried and tested after about four pints of Turkey’s finest Efes lager. This entry was posted in Food around the World, Recent Posts, Turkey and tagged Europe, Street food, Travel by Delia. Bookmark the permalink.